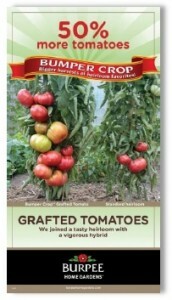 Burpee Bumper Crop Grafted Tomatoes are ideal for the increasing popularity of home gardening. Improvements to garden plants, as well as bedding plants, are always being made to ensure the most bang for your buck. Through the miracle of grafting, Burpee has improved upon several heirloom tomatoes that will produce 50% more fruit per plant! This means that you can plant fewer tomato plants and still get a “Bumper Crop” which is great news for those who only have room for patio gardening. Bumper Crop Grafted Tomatoes have taken the root stock of a tomato that has great disease resistance and combined them with six different tasty heirloom tomatoes producing healthier plants. Big Rainbow Tomatoes are mostly yellow with red at the bottom that creeps up and marbles the inside flesh as it matures. They are lumpy in shape and have a mildly sweet flavor. These heirloom tomatoes can reach up to 2 lbs each! 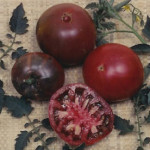 Black Krim Tomatoes have a reddish almost black coloring on the outside and are reddish on the inside with green gel around the seeds. If you are on a low-sodium diet, these are the tomatoes for you because they already have a salty flavor. 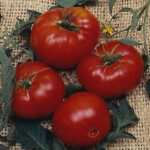 Brandywine Red Tomatoes are dark red in color and can grow to 1 1/2 pounds on indeterminate plants. Brandywine was first introduced by Amish farmers in Pennsylvania and named after the Brandywine River. They have a sweet, rich tomato flavor. Fireworks Tomatoes is an early slicer tomato. In fact, Fireworks is one of the earliest. 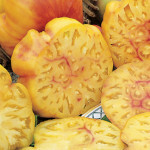 It is one of the largest of the extra-early slicer varieties with good flavor. Fireworks is bright red and slightly flattened. The meaty 2 to 3-in. (8-12 oz.) tomatoes are just the right size for your salad or sandwich. 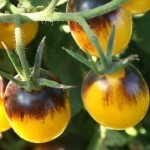 Indigo Sun Tomatoes have yellow cherry fruit with indigo anthocyanin pigmentation on the top which gives these eye catching tomatoes a two-toned look. 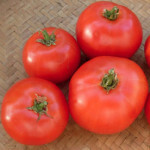 These tomatoes are quite flavorful due to a perfect balance of sugars and acid. 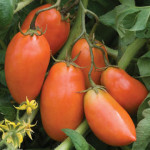 Indigo Sun produces 1 oz tomatoes in clusters of up to 8 tomatoes each. San Marzano Tomatoes have long, blocky, bright red fruit that are only 5 to 8 ounces in weight. They are great for making paste or sauce and also for canning or drying.